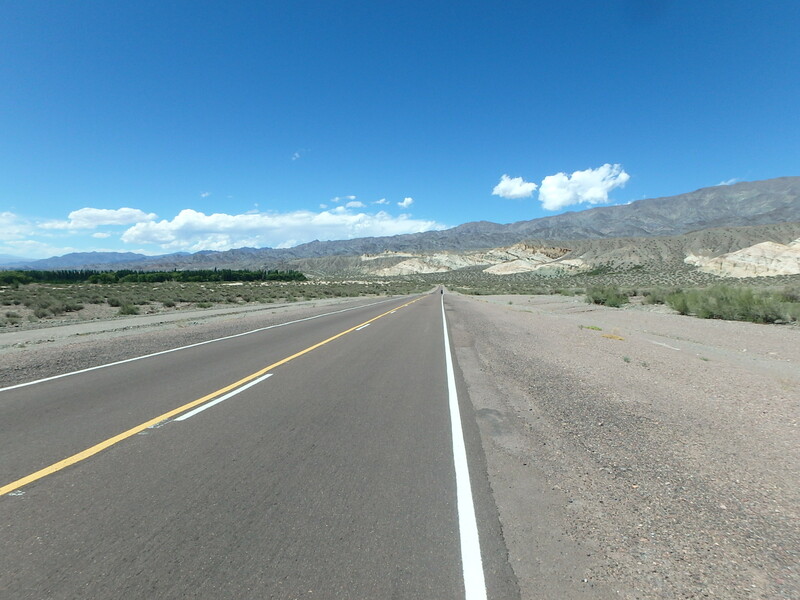 Crossing the border between Mendoza and San Juan – nothing to mention but one thing: an unexpected and strong wind comes up, for once in our favor and so we let the wind push us for another hour although it`s already six in the afternoon. Then we pass by a police control station and decide to quit the day and ask for a campplace out of the wind and the still burning sun. 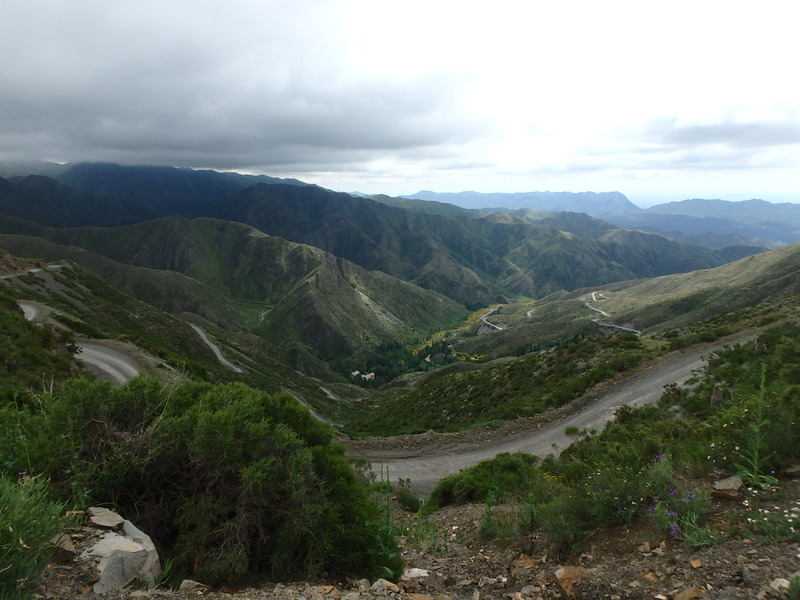 The next day it goes up into the mountains, we want to visit the Nationalpark El Leoncito, located a few steep kilometers off the main road. 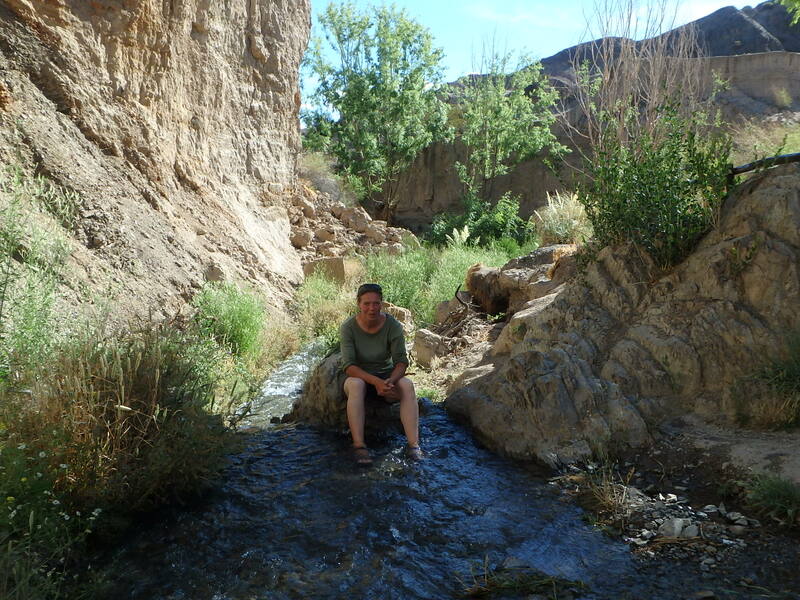 But it is worth going, as soon as we leave the flat dry desert we are greeted by the sound of streaming water, coming from a small cascade between the rocks. 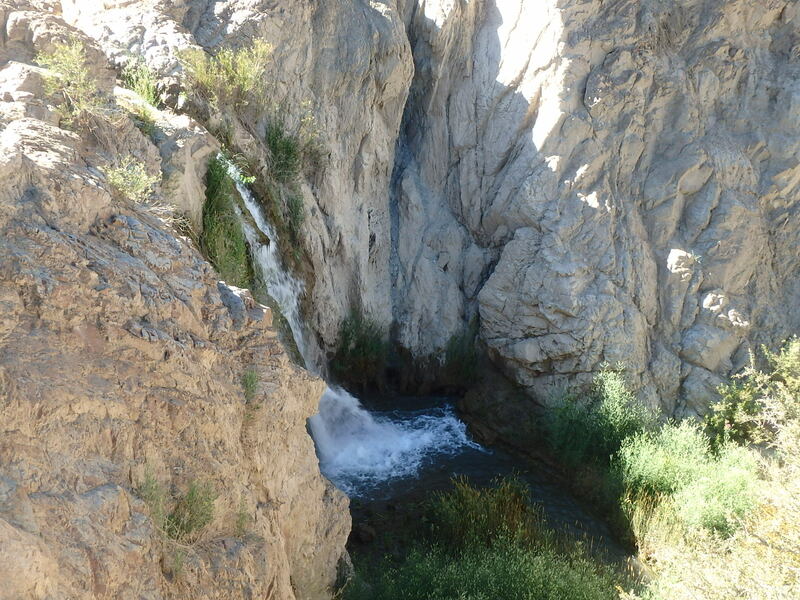 The cascade is fed by a water stream which comes down the mountains and has cut a deep canyon into the rocks over many, many years. 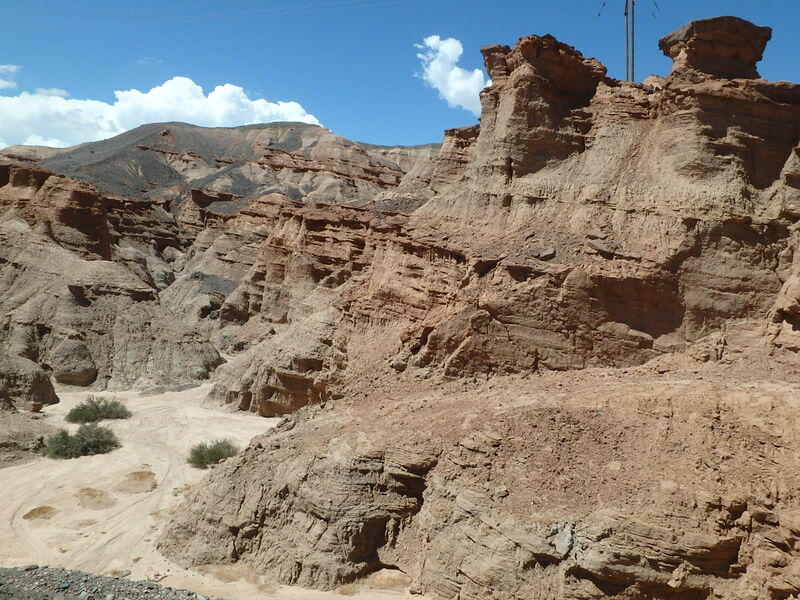 The road follows this stream upwards for some kilometers and itˋs a beautiful sight: Plants grow to both sides of the stream and form a green band which snakes its way through natural sculptured rocks of sandstone in all variations of brown. Coming to the visitors center we find a small campsite, very basic but shaded by some trees so we can stay out of the sun for the hottest hours of the day. 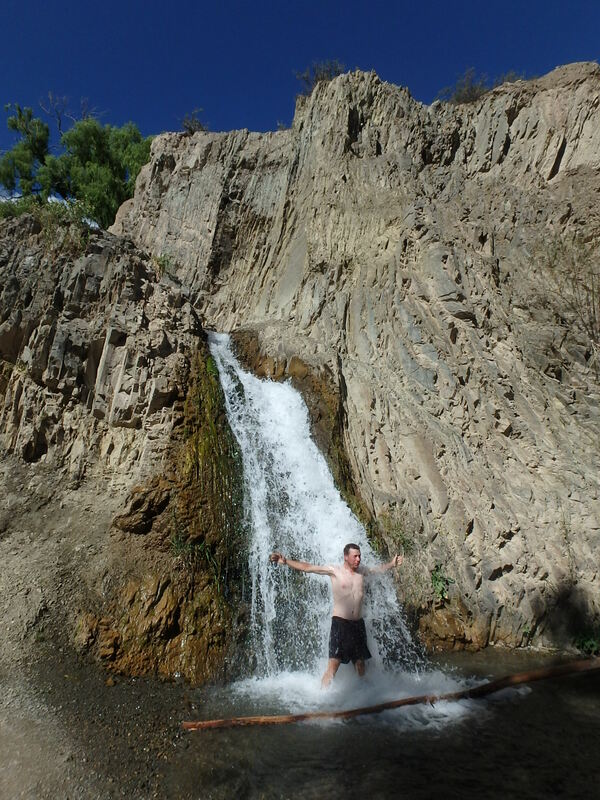 Early evening we make a small cycling tour of the park, always along the water and including a refreshing bath in the Cascada del Rincon…heavenly! After nightfall we get to know the main feature of San Juan: An amazingly clear sky. Looking up, there are millions and millions of stars, blinking and glittering as far as the eye can see. 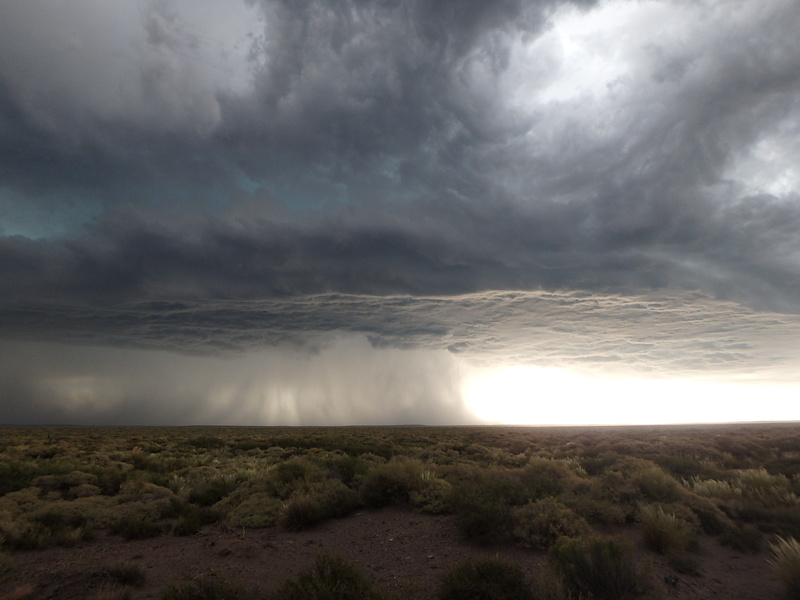 Up to now, we have seen many beautiful night skies, in the altitude of Bolivian mountains or down in desolate Patagonia, but this one is still special and we are going to enjoy many nights more with this beauty above us. 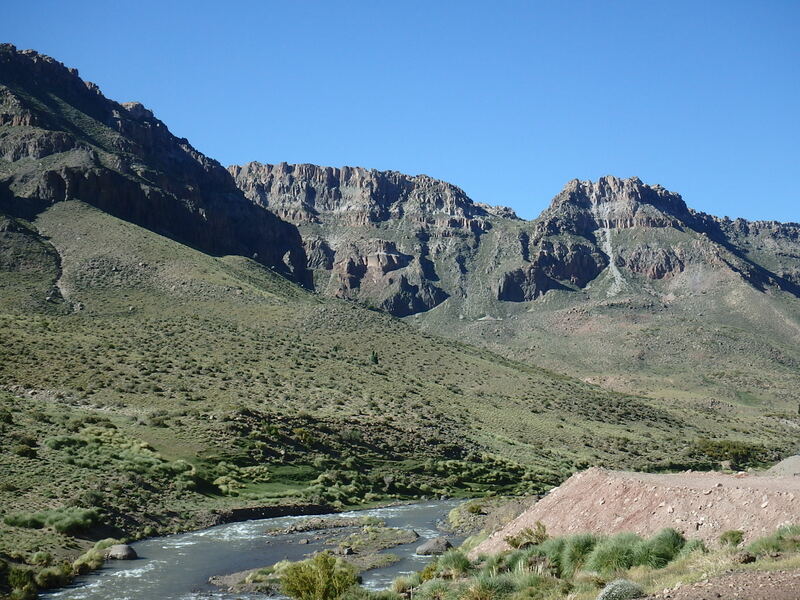 …a neverchanging scenery and even the few villages we pass by do not offer much variation, but at least provide some shade to take a rest (except for Calingasta, where we set up tent in a sports complex and to our amazement find the best showers of the whole country!). 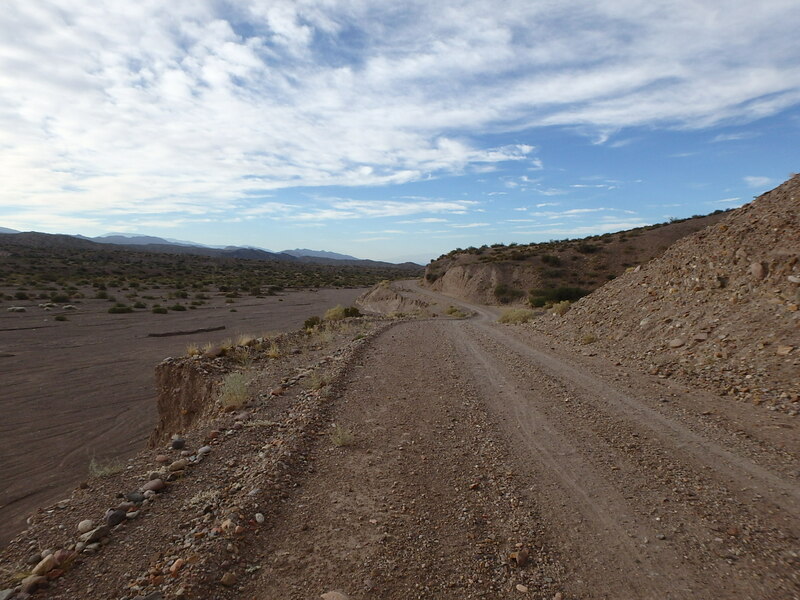 In Villa Nueva we have the great idea to take an unpaved short-cut to Iglesia instead of following the paved main-road, and history repeats itself. After getting up at 5AM we have to push and push and push our bikes the whole day before we finally reach the one and only sign of human existence along the way, Tocota. 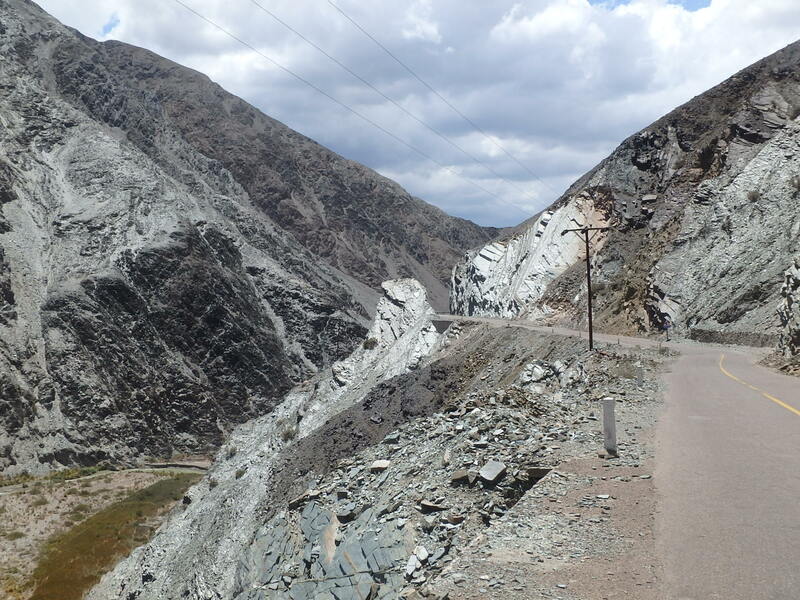 More of bad ripio the next day but at least rideable and we are glad to reach Iglesia in the early afternoon. Too bad that it is the time of Siesta, like always between 1 and 5PM, and everything is closed. 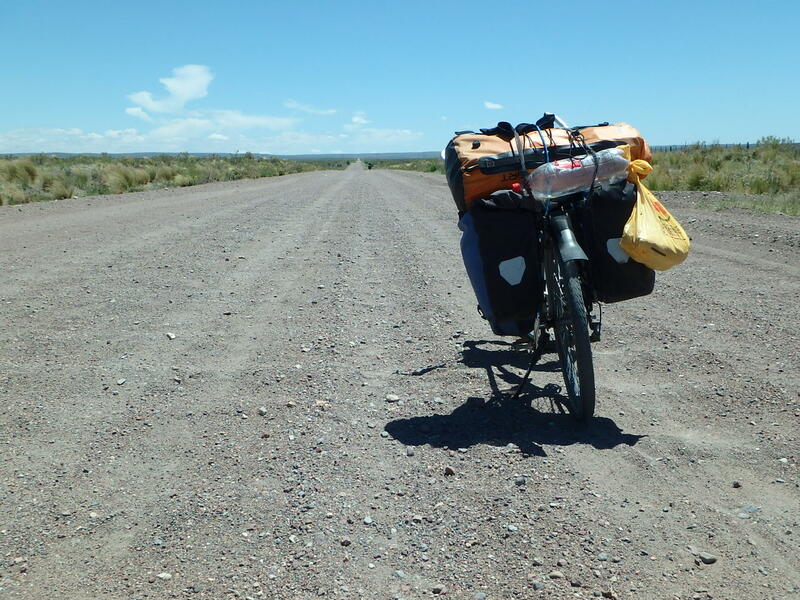 So we continue cycling in search of a cold drink and some shadow until we find both in Las Flores and even a campspot on the local sports complex where we stay for two days. 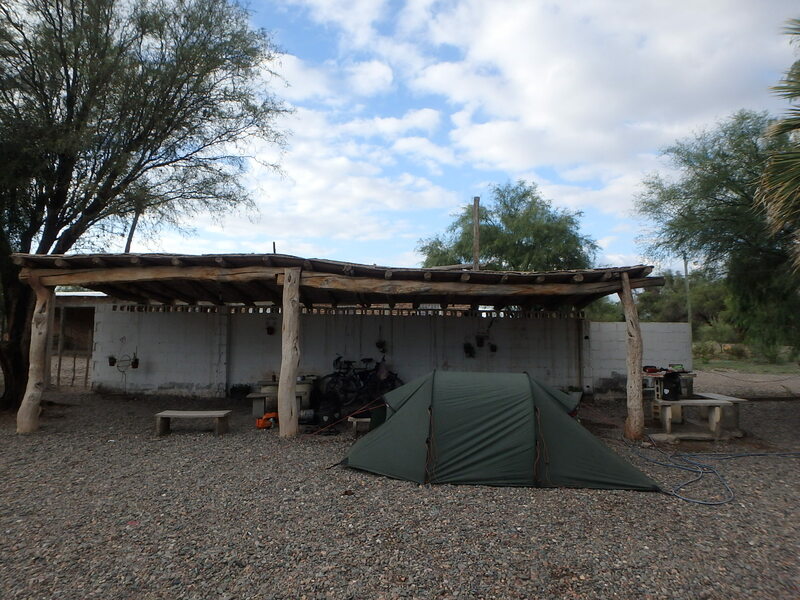 We have to move around our tent sometimes when there is a football game but since the place is cheap and – willing or not – the only possibility to set up tent we donˋt bother and enjoy the lazy time with barbecue and cold showers. 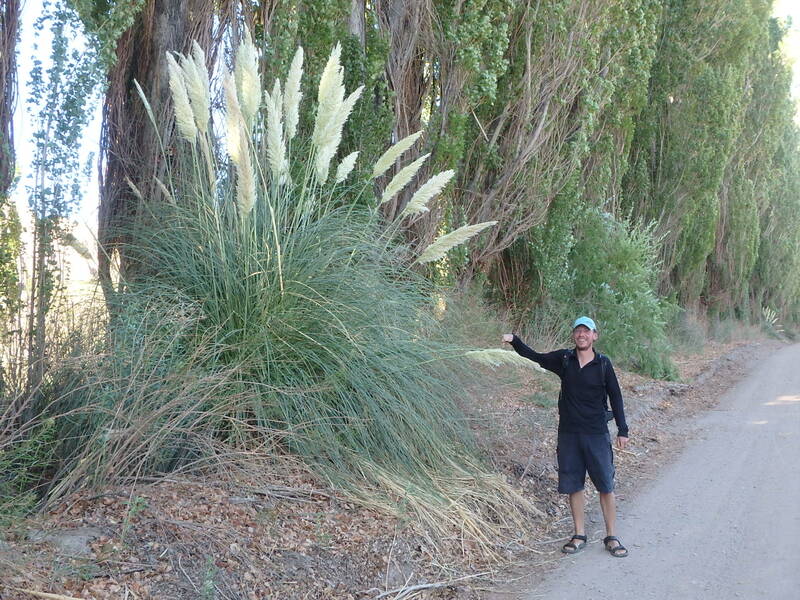 From Las Flores on cycling becomes a little bit more interesting. 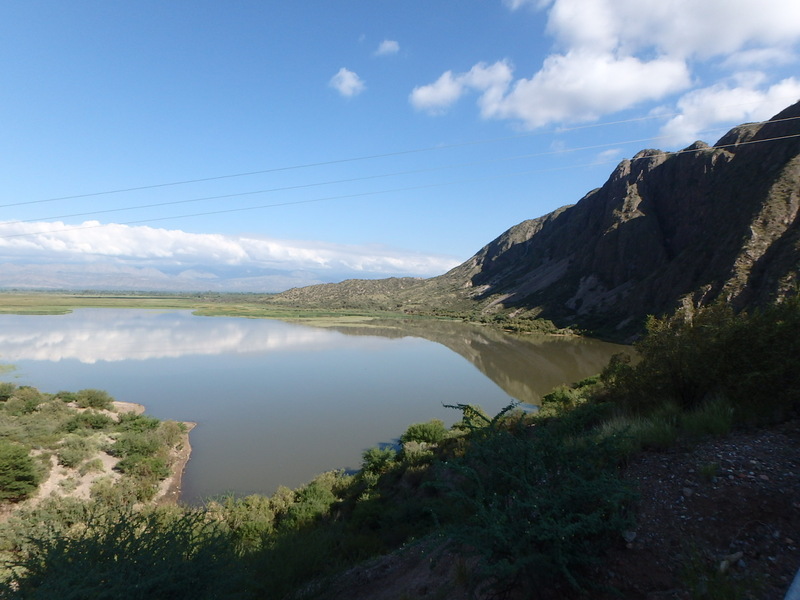 We pass by Rodeo and a big dammed lake, the Dique “Rincon del Viento” which is used for all kinds of water sports. The area hasnˋt stolen its name, a constant fierce wind (of course as headwind for us) is forming the surrounding sandrocks into gigantic sculptures and once more we can see how nature never stands still but is always transforming the enviroment. 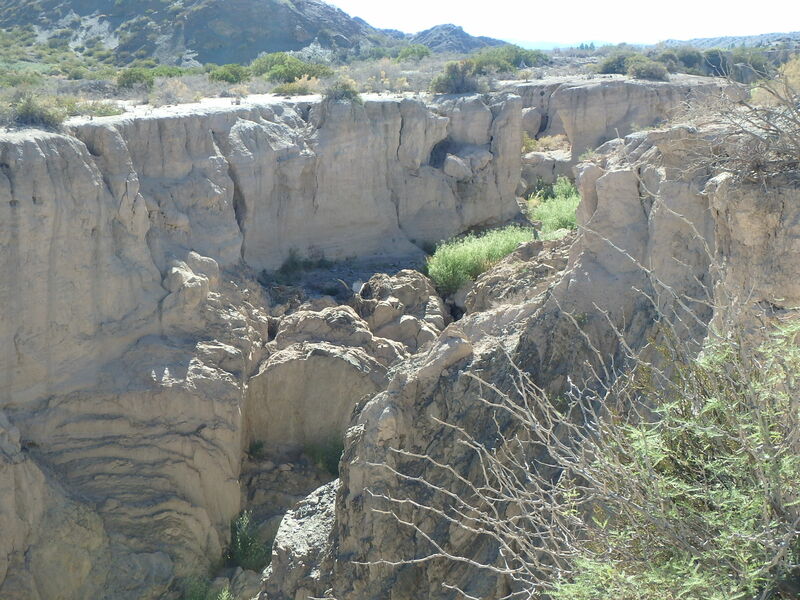 Then it goes through an equally beautiful Canyon towards San Jose de Jachal. The road snakes its way up and down along dark glittering rocks above a deep green valley, a nice mix of colours and a welcome change of sight. 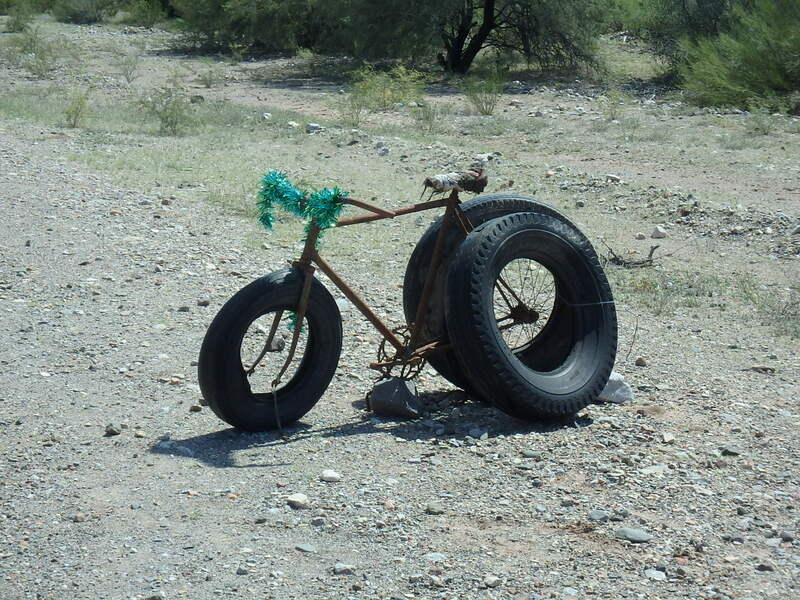 Being distracted like this, kilometers come easy. 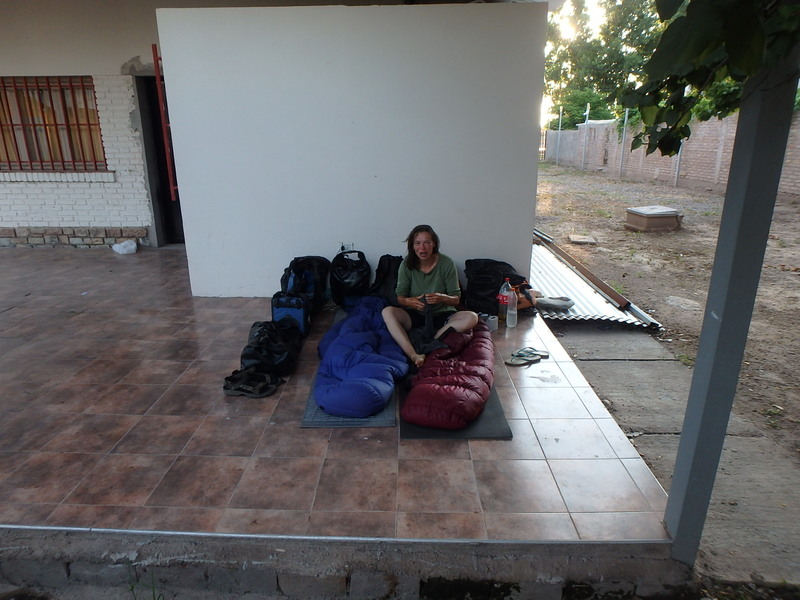 We reach San Jose de Jachal faster than we thought and once again itˋs Siesta, so we relax a few hours at the Plaza. It is a middle-sized town but has only one paved main road and makes a somehow devastated impression. 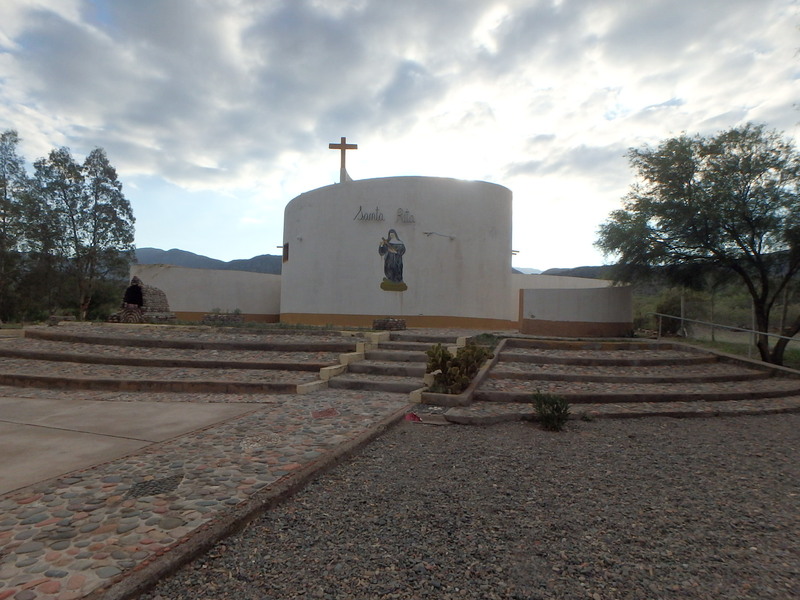 We are not really tempted to stay, the more because the Camping lies very isolated outside of town and the usual options like Bomberos, gas station, church and Vialidad donˋt work out. So we just wait to buy some food and then continue cycling although we have already done 85km this day. 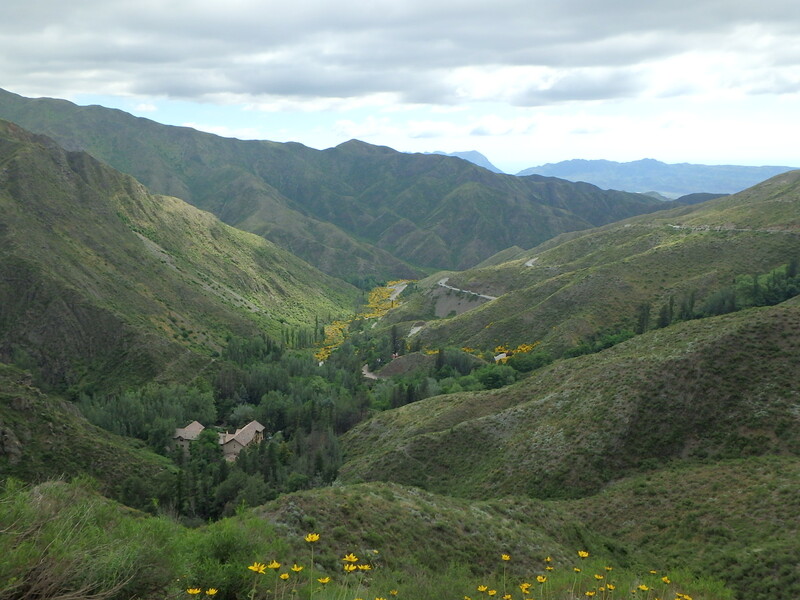 The reward comes 8km further when we reach a small but well-visited Chapell, La Capilla de Santa Rita. 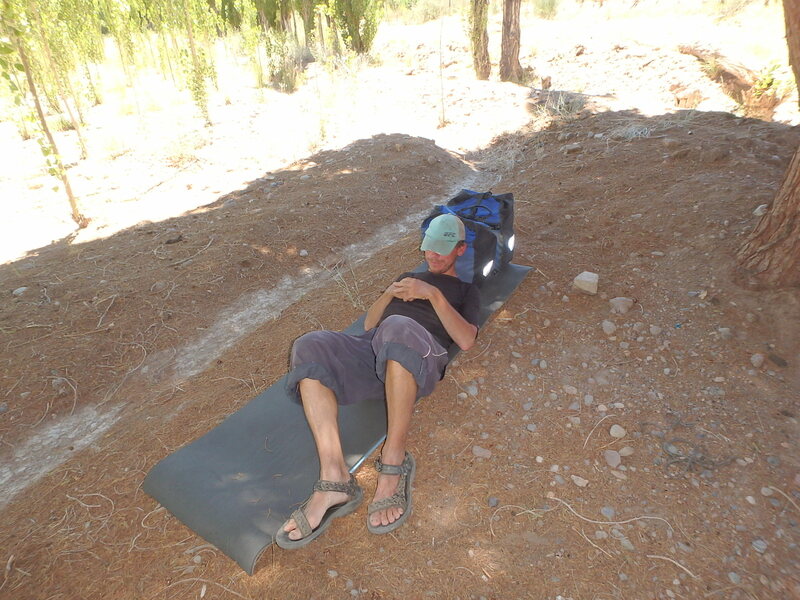 There are benches, barbecues and drinkable water and itˋs a very quite place but the stones where we put up the tent have safed the heat of the day and it feels like sleeping on a stove. 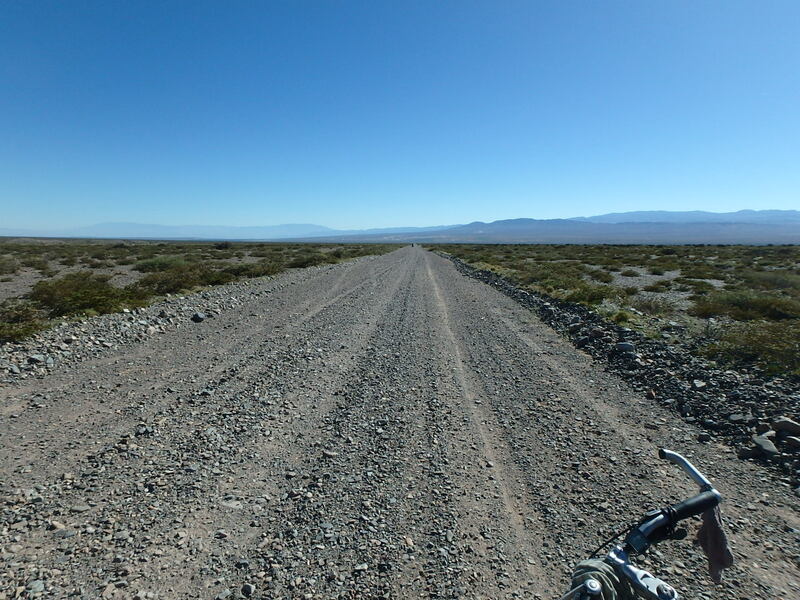 Then another smooth climb brings us to the highest point from where the road winds itself down for some kilometers until the crossing with the Ruta 40 – and we are back in the dry hot semi-desert. We donˋt have to wait long. The first car stops but the driver says heˋs fully loaded and continues. But a few minutes later we see him coming back and with the words “You are going to die in this heat!”, he starts packing our stuff on top of his load. 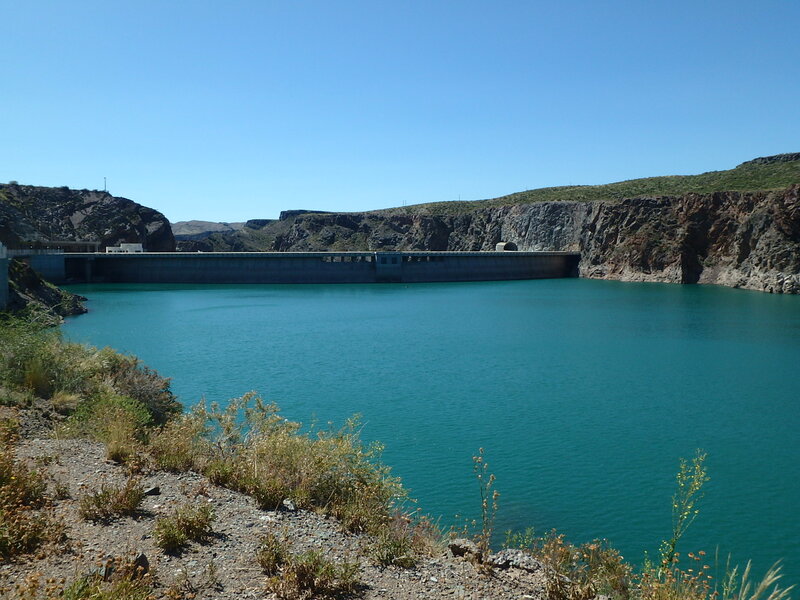 Itˋs a nice guy and the drive to Chilecito passes by very fast and easy inside the car with the luxury of air-condition. Luck stays with us in the city itself. 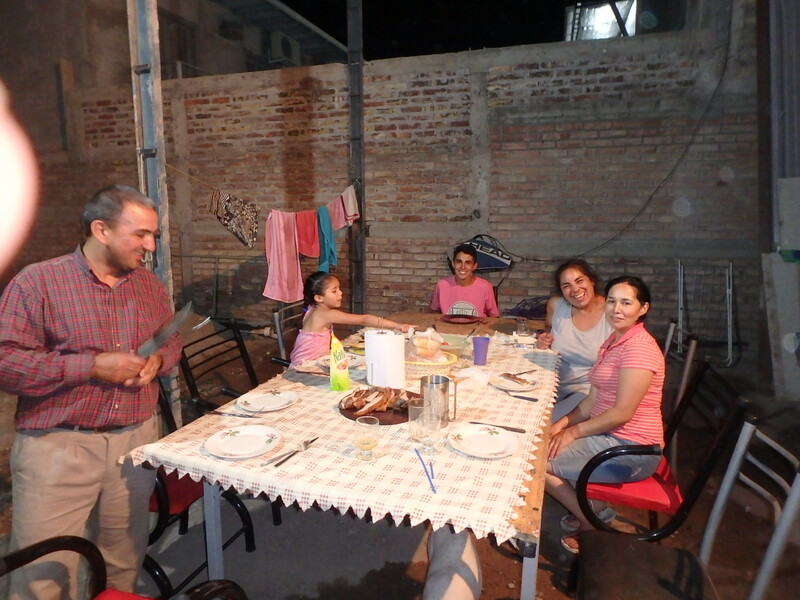 Although we look for a warmshowers-host on very short notice, we find one and spend a quiet day with Jorge and his family. 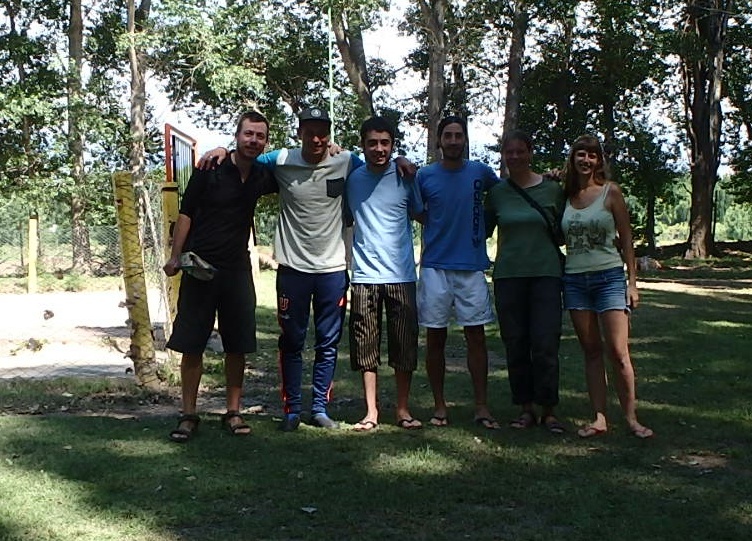 Once again we are astonished and happy about these nice open-hearted argentinian people!!! 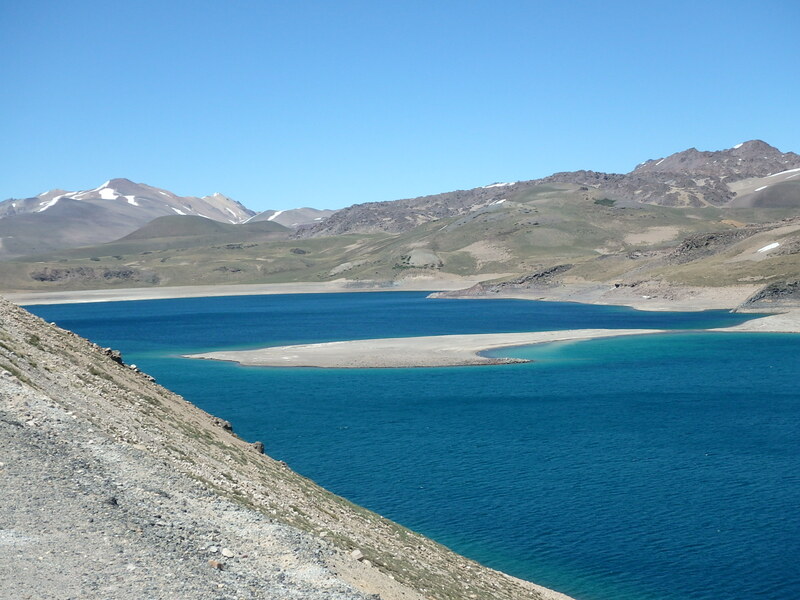 To get from Chile to Argentina we have to pass by the beautiful Laguna del Maule and cross the Paso Pehuenche. 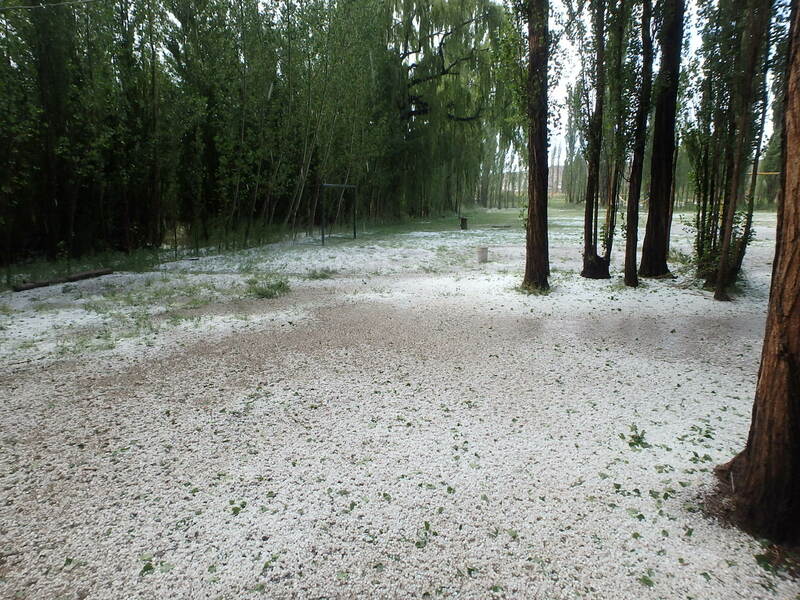 Doing this, we instantly notice a change in climate. 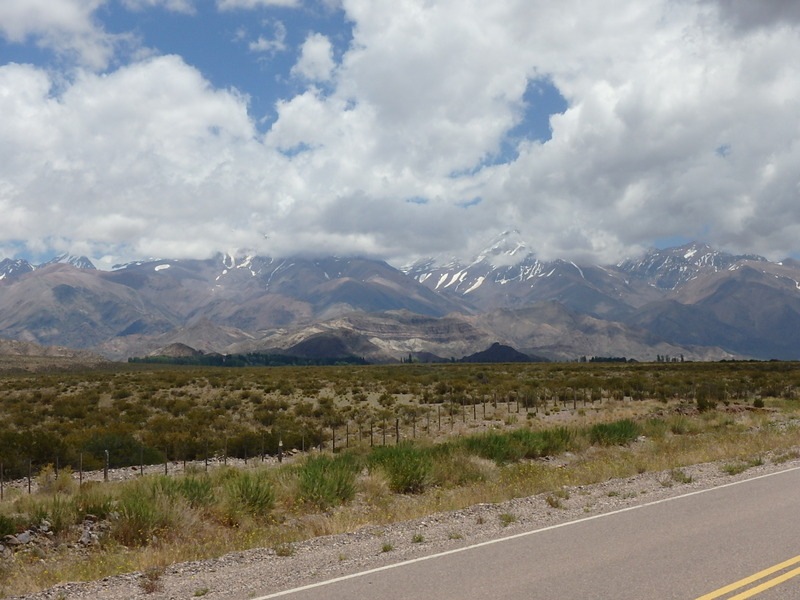 Big chunks of snow leftovers and chilly winds on the chilean side, green covered hills and a warm breeze on the other. 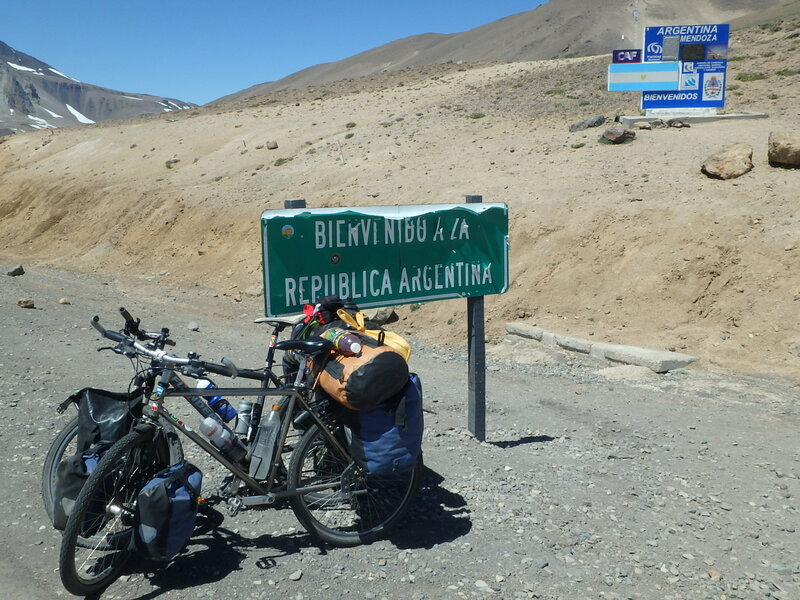 This nice breeze takes us straight down to the argentinian migration, where we enter the country for the 10th time now. 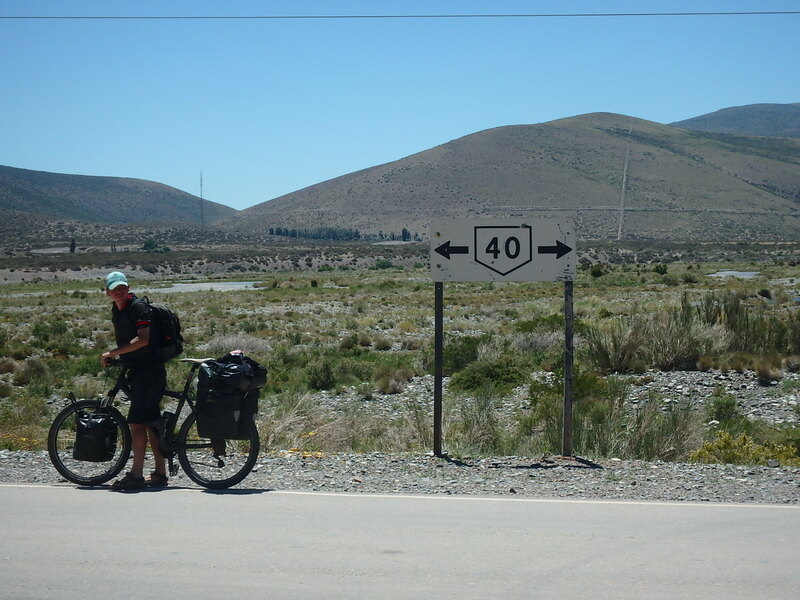 The next day we get to the junction with the “Ruta 40”, also known as “la cuarenta”. 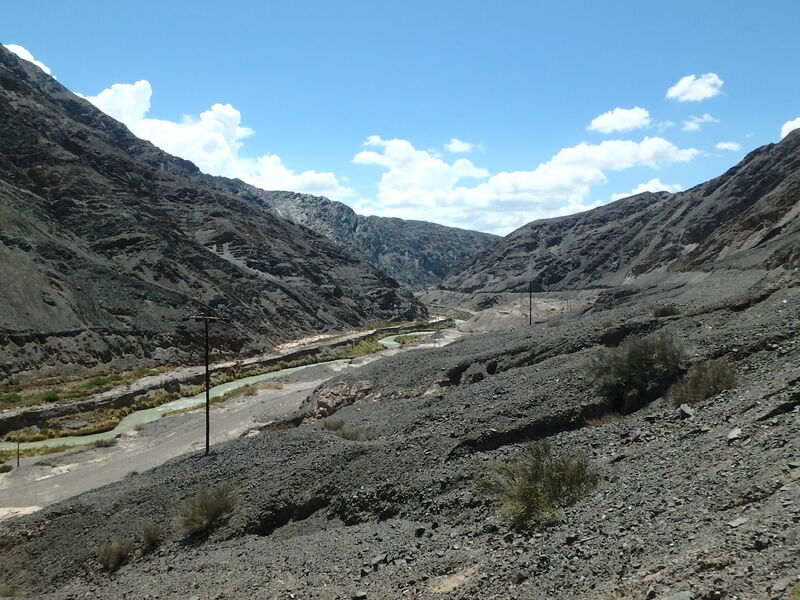 An incredible heat, not a single tree or plant which comes above knee-level, a tormenting wind and a fair part of uphill riding give us the first glimpse of what it means to cycle this road even before we get to Malargue, the first bigger village along the way. 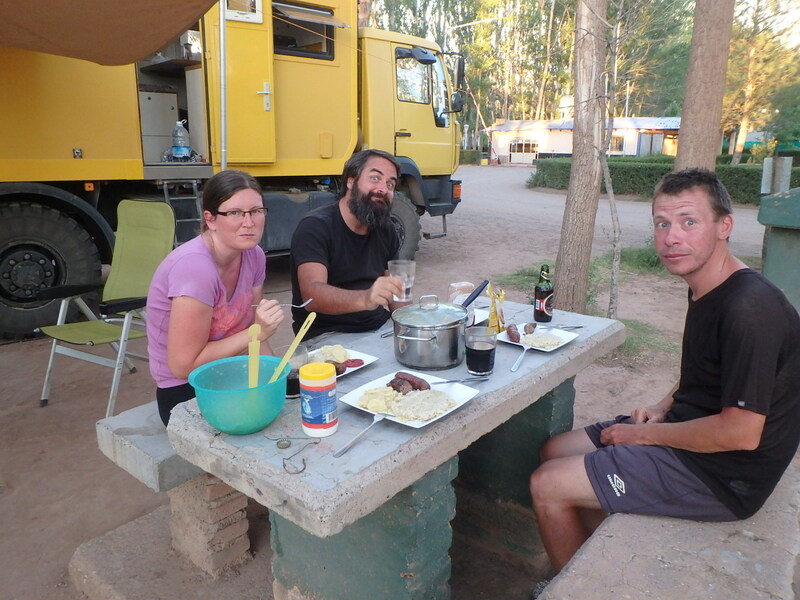 Once arrived, we stay there on the Camping Municipal and spend most of our time with Holger and Viviane, who have been travelling the Americas by truck for 2,5 years now. Nice company and a lot of stories, we are tempted to stay for some days more but canˋt, because we agreed with Felix and his family to meet for New years eve in Tunuyan, some 200km further north. 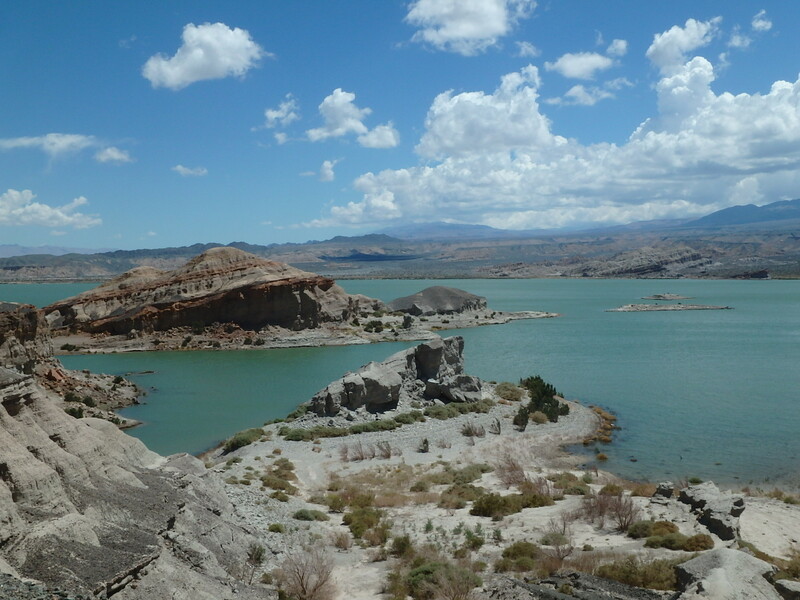 So when we leave, we are a little bit in a hurry and decide not to take the paved road which makes a big detour for San Rafael but follow the 40 which has an unpaved part of 120km and passes by the Embalsa Agua del Toro. Remember the part of the heat and wind above? There we are again. 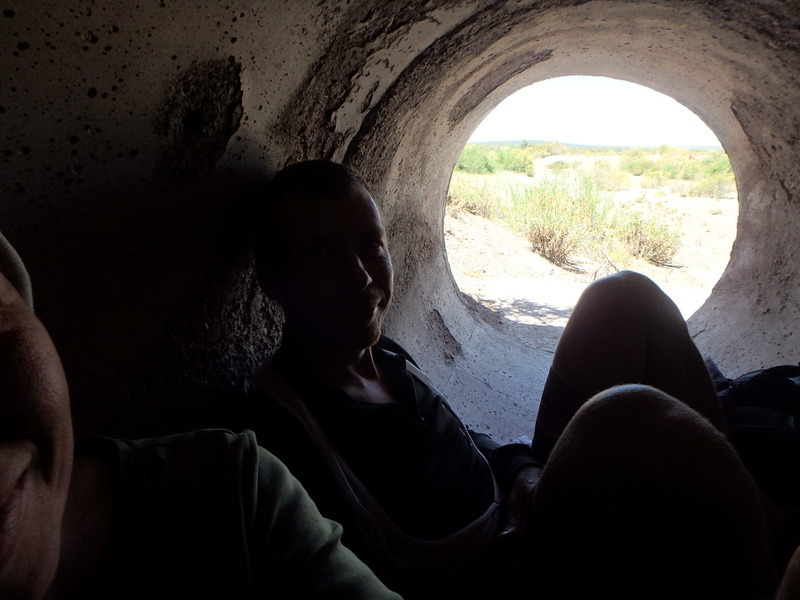 It turns out there is no shade whatsoever on the whole stretch, except for one little sewer where we can rest a bit. 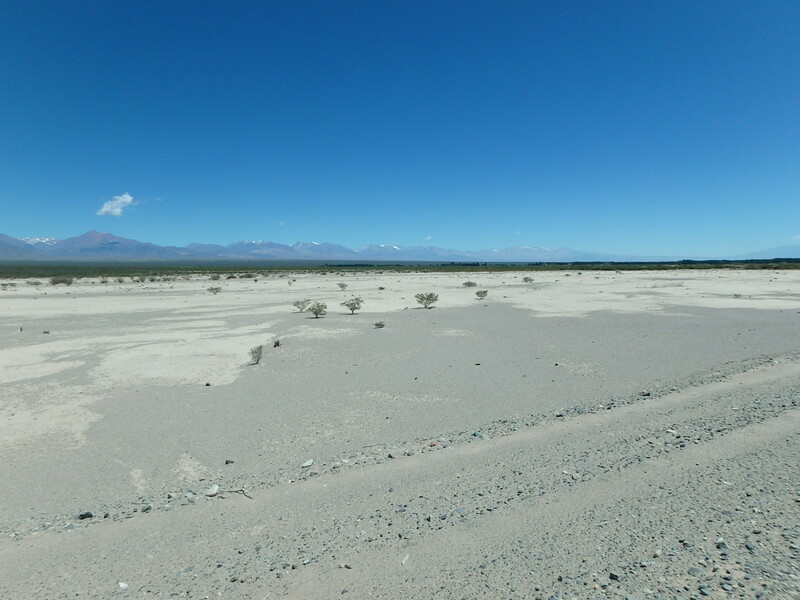 And while the first 60km are at least rideable ripio, the other 60 are a sandpit. The small city itself isnˋt very appealing but here we meet one of the most kind persons in Argentina: Eduardo, of whom we unfortunately donˋt have a picture. 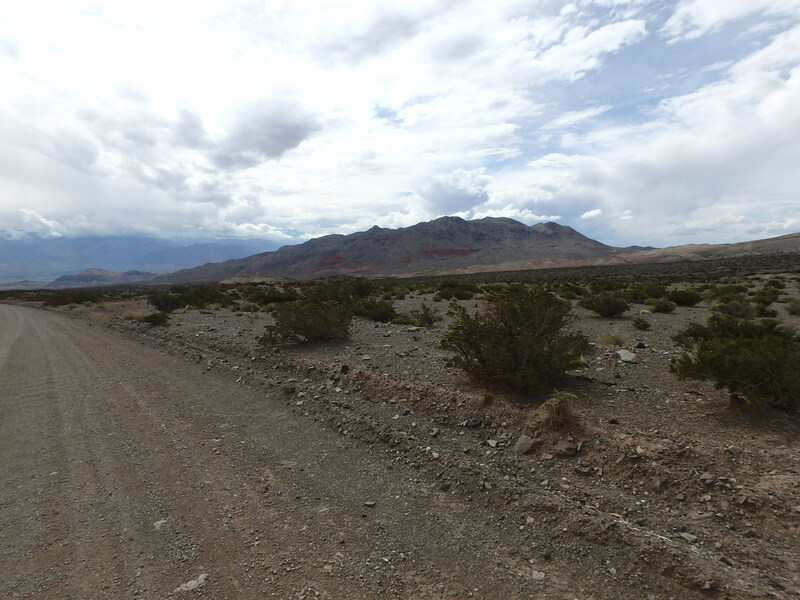 We get to talk to him while in search for a sleeping place and within seconds he turns our search into his personal project: First he calls the nearest campgrounds, but they are all too expensive since its New years eve. Than he packs our bikes and luggage onto his camionetta and we drive to a local leisure park, but unfortunately its only for “uso diurno” and camping is prohibited. Now he gets very ambitious and so we drive to the Municipalidad, where he asks every oficial person about affordable sleeping places for visitors, and at last one possibility shows up: We can stay for free on the Camping Municipal in Manzano Historico if we find a way to get there: 40km out of town up into the mountains. And guess what happens? Before we can even think about it we are on the way with Eduardo who doesnˋt take no for an answer. 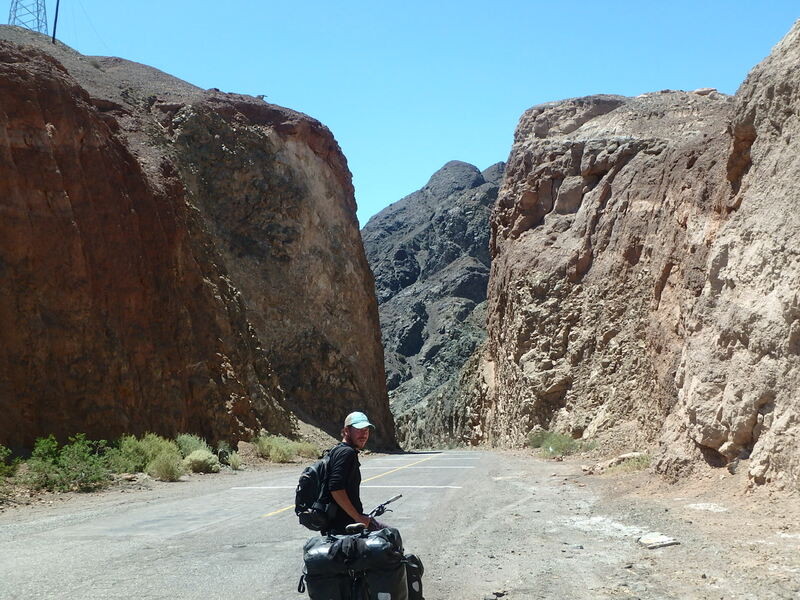 Being a short distance cargo driver, 40km are nothing for him, he says, and for his and the cities´ honor it´s impossible to leave us to ourself before we are in a “safe” place for the night. 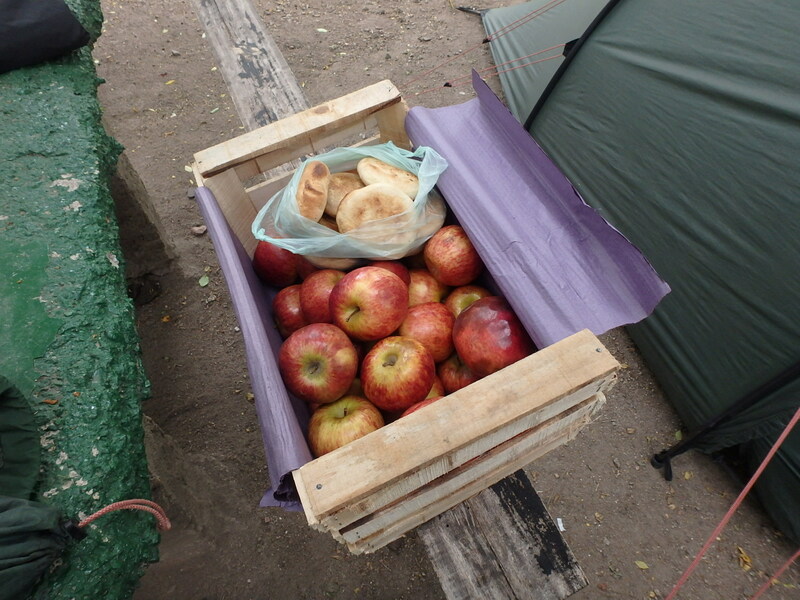 So we reach the camping Manzano Historico in the late afternoon, packed with apples and tortitas for surviving the evening, and say good-buy to our angel Eduardo. 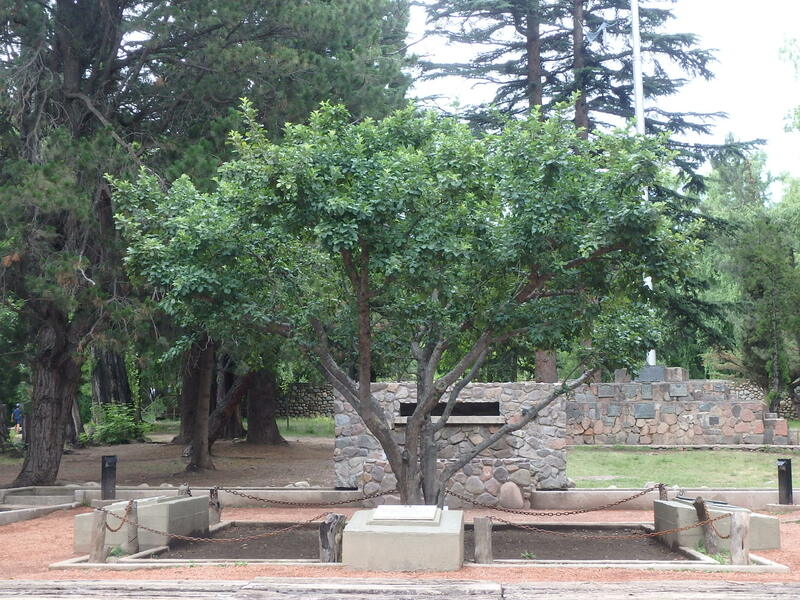 To end up here is one of the unexpected turns a bicycle-trip can make, but a great one because we get to visit a historical place: During the independance war the famous General San Martin crossed the Andes after having fought in Chile and it was exactly at this “Manzano” (apple tree), where he took a rest and reunited with his troops who were guarding the border. We are not sure if itˋs still the same tree, but itˋs a national monument and the four big campgrounds out of which the whole place consists cannot contain the crowds of people who come at weekends or holidays for making their everpresent asado and relax, even if itˋs sometimes only for one day (300km forth and back for an asado, something no european would consider). The bad news for us is that Felix wonˋt come, there are problems with the harvest and he canˋt leave the campo, so our New years eve is a little bit shaded. 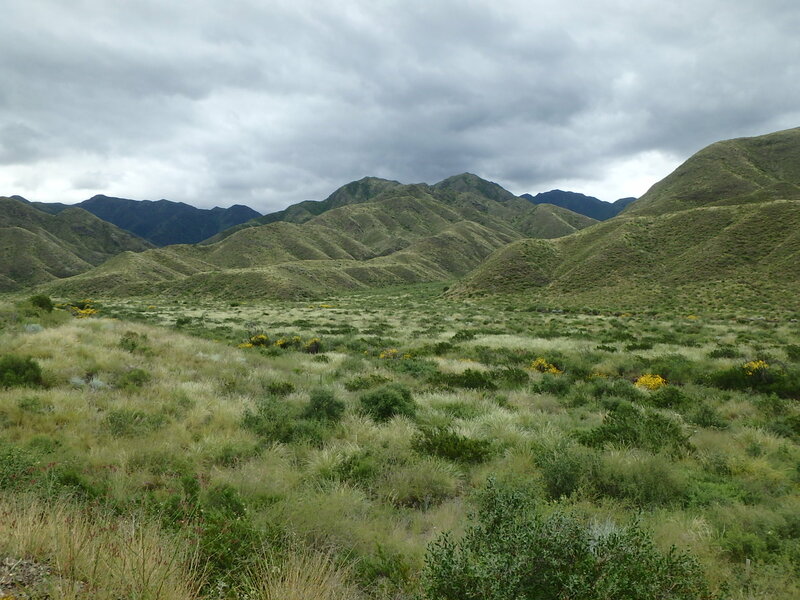 To get there we donˋt turn back to the 40 but pass through la valle de Tupungato with los Cerrolitos (a little mountain range) and than by kilometers of vineyards since Mendoza is one of the most famous wine regions. 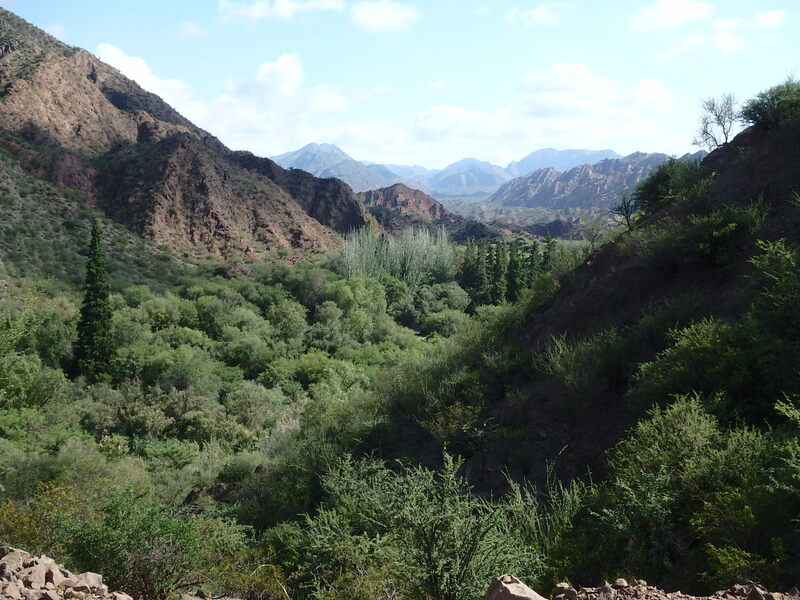 In Ugarteche we witness a car accident, in Agrelo we sleep at a Puesto de Salud in open air and in Godoy Cruz begins the Avenida San Martin, a tree-lined boulevard which stretches for about 40km from south to north of Mendoza. Entering the city we donˋt find the quiet, relaxed city of our last visit – itˋs high-season now, full of tourists and with incredible price increases for accommodation, out of our budget range. 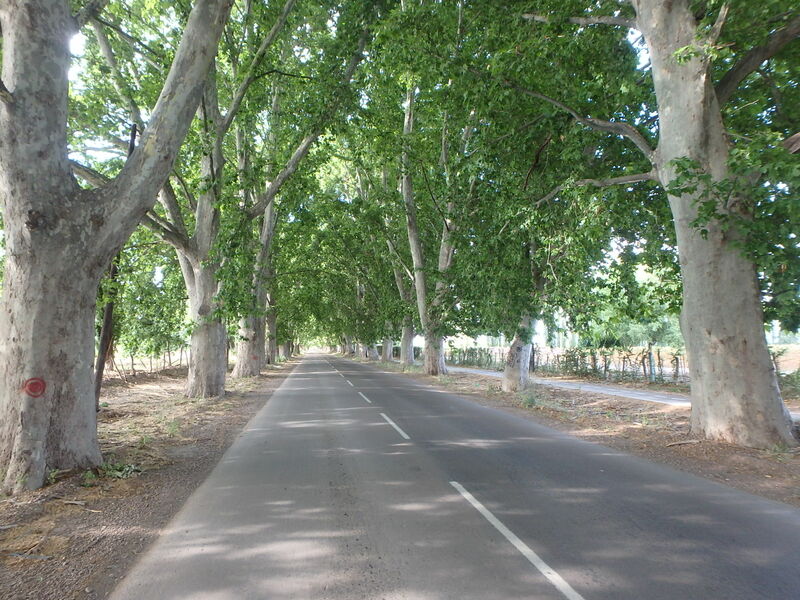 So we drive on, still along the Av San Martin, onto Las Heras, what the locals subscribe as an unsafe neighbourhood. 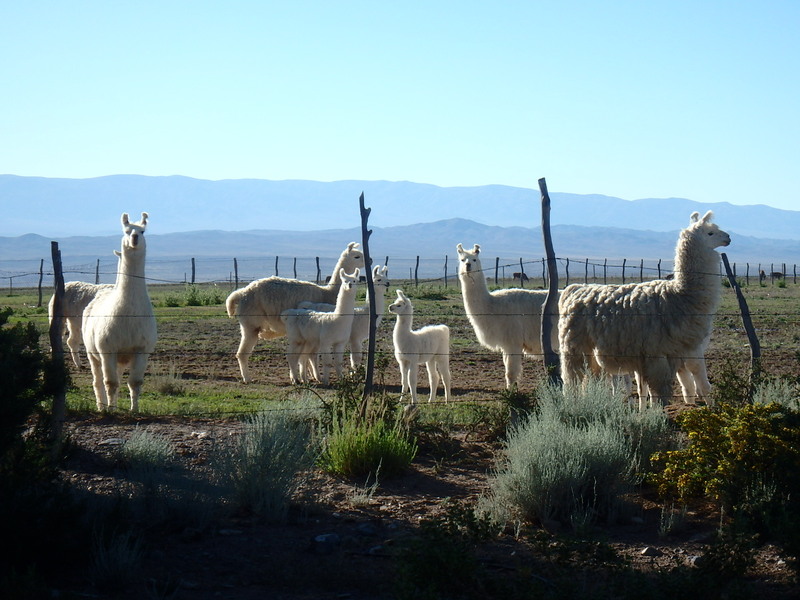 Almost all the way through Las Heras, we are called by a man from his car, so we get to meet Titi, our second argentinian angel. He asks us what we are looking for, and upon our reply immediately offers us his patio to camp on. Of course we accept and from this moment on we are under the care of him and his family: cold drinks and a hot shower, delicious asado (punta de espalda, a real delight to eat) and the one room with airco to sleep in (without the possibility to reject). 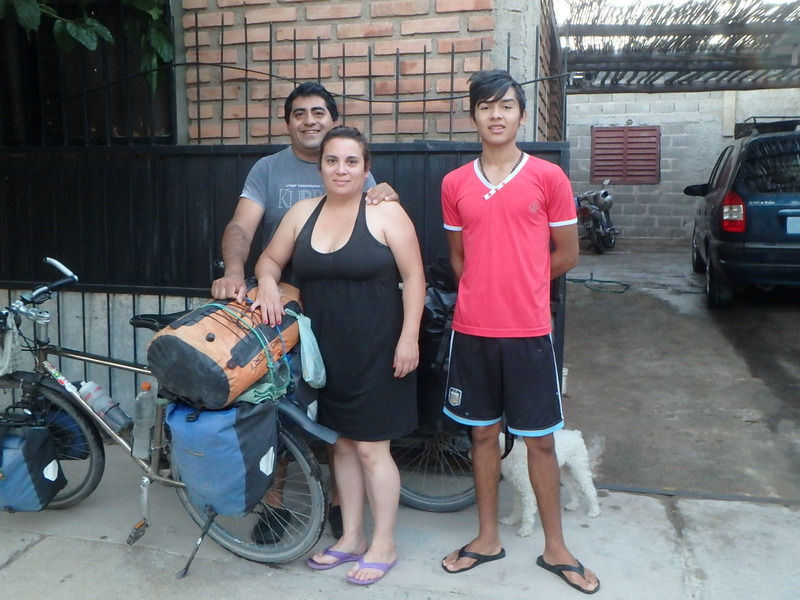 We end up staying for two nights and when we leave, Titi loads bread, mate, facturas and alfajores on our bicycles, enough for several days and again without the possibility to reject. When such an encounter takes place in a so-called unsafe neighbourhood, we would not mind passing through every bad part of every major city on our way. 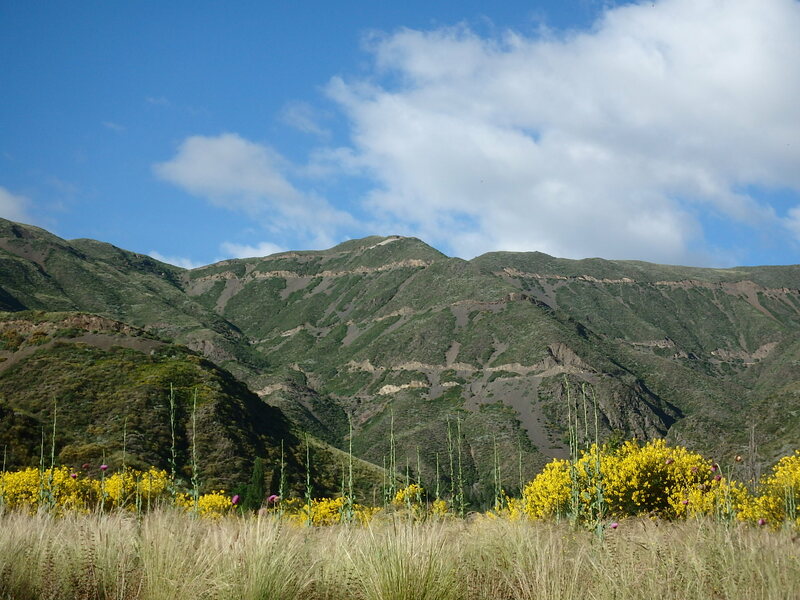 So we are off to Uspallata, taking the road which passes by Villavicencio, the famous mineralwater spring in the mountains. 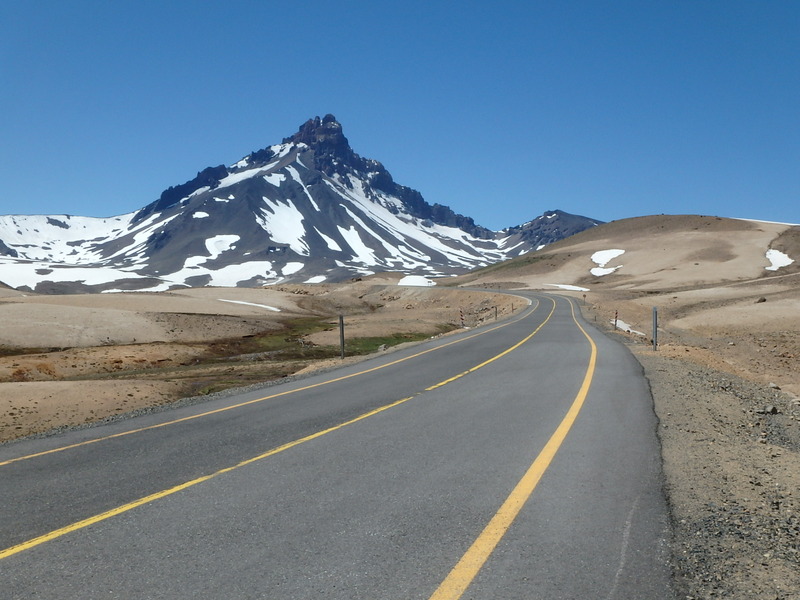 Itˋs a two-days climb, coming from 750m in Mendoza and going over 3000m at the highest point, and itˋs one of the most beautiful stretches we do on our way north. 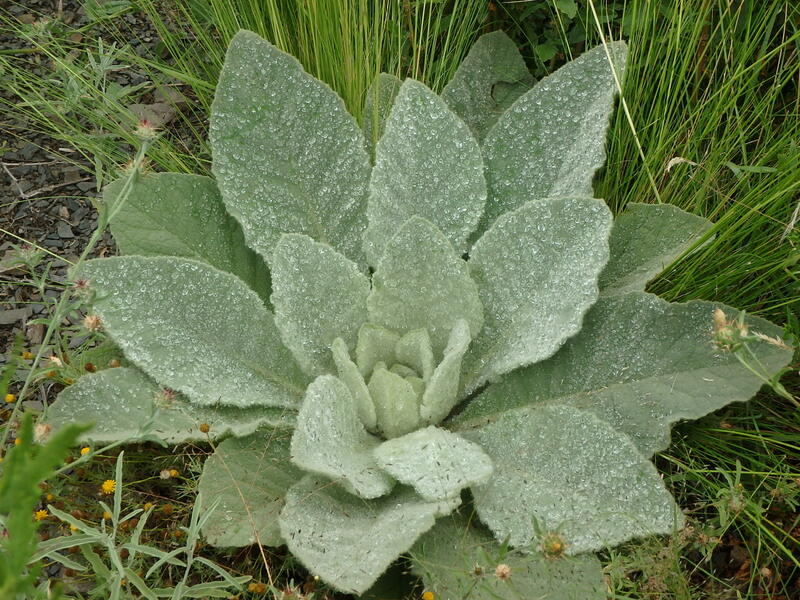 The t° is supportable because of a clouded sky, all is green, hardly any wind and we cycle on a good dirtroad. 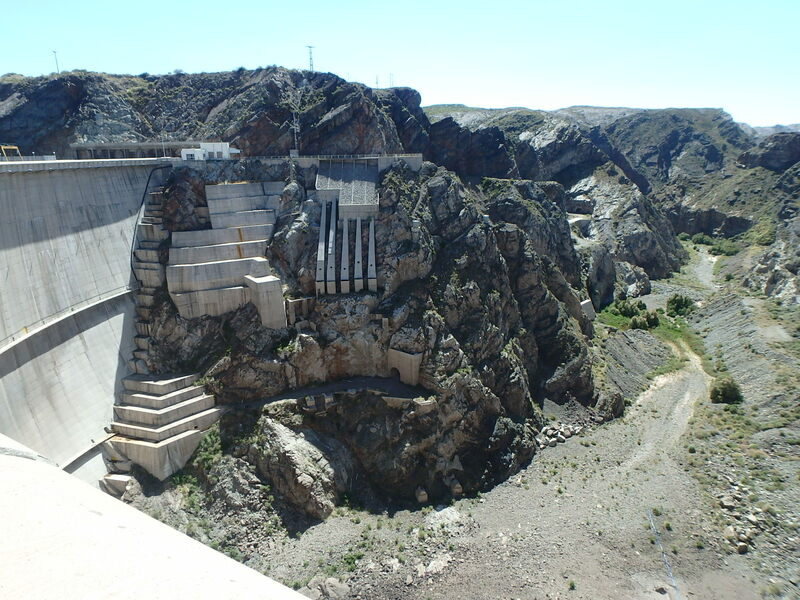 Once there also was a luxury hotel with a Spa, but it has been closed for many years and only serves as an orientation point when one starts climbing the Caracoles (snailway), also called Camino de un ano (road of one year) because of the 365 curves and/or bends over a length of 28km. 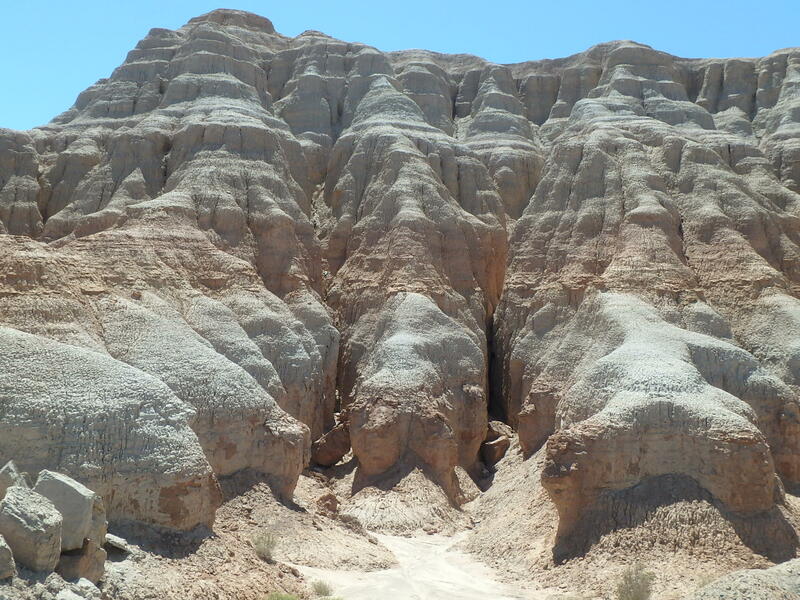 The climb brings incredible views with it, one can see forth and back for an hour of riding. 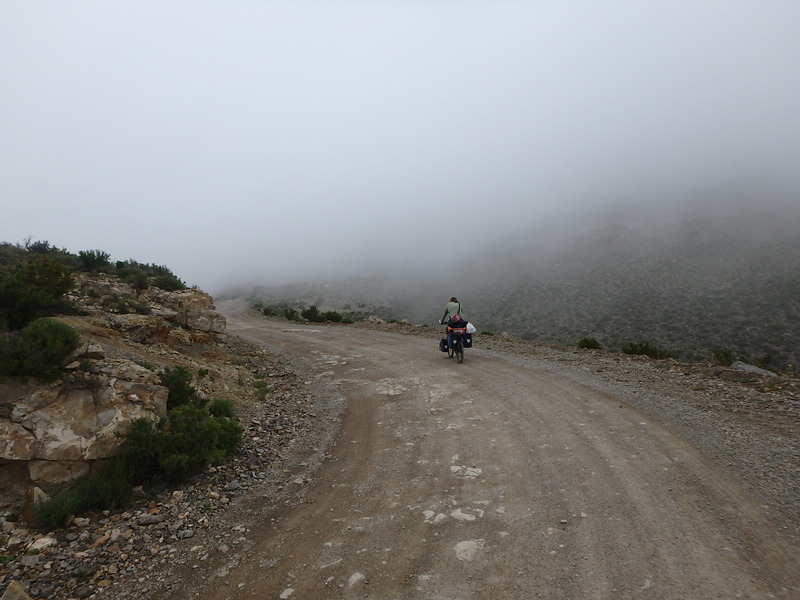 When reaching the top, the clouds get darker and darker, so we decide to set up camp after some km of downhill instead of going all the way to Uspallata. A good decision as we learn the next day, while we were just hit by some drops of rain, the campsite in Uspallata was completely flooded and everybody is drying their tents and gear when we arrive there. Nonetheless the spirit of the people is good and we get in contact really fast. 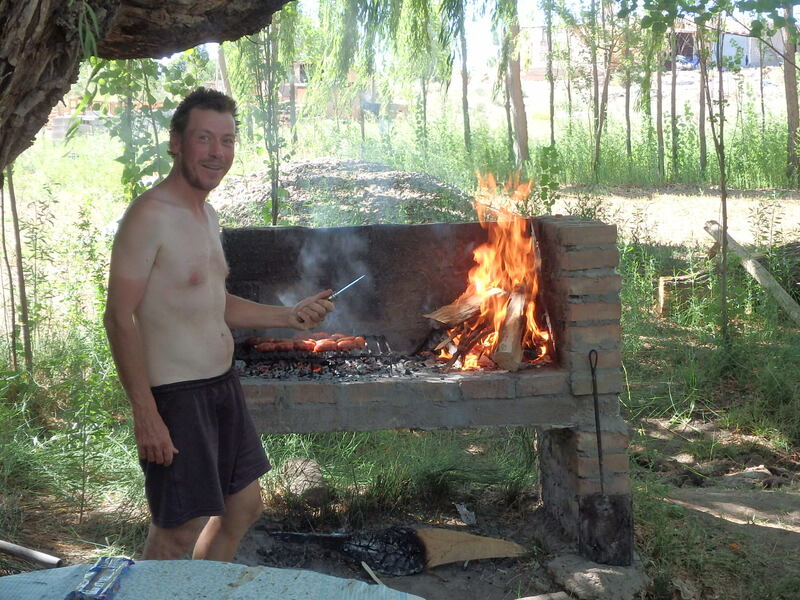 We share our lunch with Lautaro, a nice argentinian guy from Buenos Aires who helps us start a fire with the humid wood lying around (nobody in the whole world is able to get a fire going like the Argentinians) and the next evening he and his friends invite us back for asado. 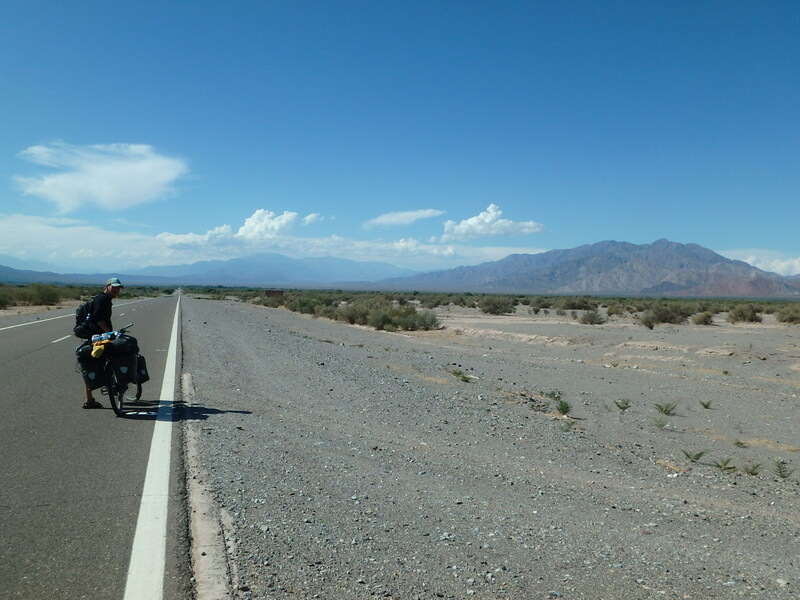 Leaving Uspallata we again enter the typical dry semi-desert and sweat under the hot sun, the cooling clouds stay stuck over the distant mountain peaks while we cycle our last 60km, heading out of the Provincia de Mendoza.